Search from over 500 delicious recipes! Check your local store for details. Learn recipes for amazing organic, vegetarian, vegan, gluten-free, and raw food dishes that are easy to make! Enjoy free and fee-based cooking classes at our Kailua, Honolulu, Kapolei, and Kahului store locations. Join us to see how to use local, organic, and wholesome ingredients to make healthy and delicious entrees, soups, breakfasts, and desserts. We offer cooking classes, mini-workshops, and hands-on cooking for kids. If you're interested in attending a class, please visit our Events page to see what classes are available or if you'd like to inquire about a private cooking class, please email us at communityoutreach@downtoearth.org or give us a call at (808) 947-3249. Learn how to use local, organic, and wholesome ingredients to make healthy and delicious entrees, soups, breakfasts, and desserts. Discover recipes for amazing organic, vegetarian, vegan, gluten-free, and raw food dishes that are easy to make! With our extensive cooking and baking experience you'll find our classes to be a wealth of information, and the engaging personalities of our chefs make these classes great fun! 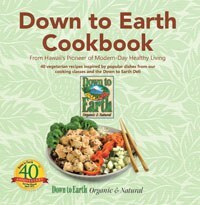 Cooking classes are conducted by members of Down to Earth's Love Life! Community Outreach Team, all of whom are vegetarian, vegan, or raw food chefs.